Hemorrhage: Severe and fatal hemorrhages occurred with CABOMETYX. The incidence of Grade 3 to 5 hemorrhagic events was 5% in CABOMETYX patients. Discontinue CABOMETYX for Grade 3 or 4 hemorrhage. 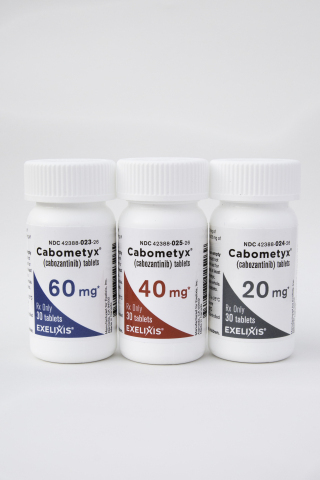 Do not administer CABOMETYX to patients who have a recent history of hemorrhage, including hemoptysis, hematemesis, or melena. Perforations and Fistulas: GastrointestinaI (GI) perforations, including fatal cases, occurred in 1% of CABOMETYX patients. Fistulas, including fatal cases, occurred in 1% of CABOMETYX patients. Monitor patients for signs and symptoms of perforations and fistulas, including abscess and sepsis. Discontinue CABOMETYX in patients who experience a fistula that cannot be appropriately managed or a GI perforation. Thrombotic Events: CABOMETYX increased the risk of thrombotic events. Venous thromboembolism occurred in 7% (including 4% pulmonary embolism) and arterial thromboembolism in 2% of CABOMETYX patients. Fatal thrombotic events occurred in CABOMETYX patients. Discontinue CABOMETYX in patients who develop an acute myocardial infarction or serious arterial or venous thromboembolic event requiring medical intervention. Hypertension and Hypertensive Crisis: CABOMETYX can cause hypertension, including hypertensive crisis. Hypertension occurred in 36% (17% Grade 3 and <1% Grade 4) of CABOMETYX patients. Do not initiate CABOMETYX in patients with uncontrolled hypertension. Monitor blood pressure regularly during CABOMETYX treatment. Withhold CABOMETYX for hypertension that is not adequately controlled with medical management; when controlled, resume at a reduced dose. Discontinue CABOMETYX for severe hypertension that cannot be controlled with anti-hypertensive therapy or for hypertensive crisis. Diarrhea: Diarrhea occurred in 63% of CABOMETYX patients. Grade 3 diarrhea occurred in 11% of CABOMETYX patients. Withhold CABOMETYX until improvement to Grade 1 and resume at a reduced dose for intolerable Grade 2 diarrhea, Grade 3 diarrhea that cannot be managed with standard antidiarrheal treatments, or Grade 4 diarrhea. Palmar-Plantar Erythrodysesthesia (PPE): PPE occurred in 44% of CABOMETYX patients. Grade 3 PPE occurred in 13% of CABOMETYX patients. Withhold CABOMETYX until improvement to Grade 1 and resume at a reduced dose for intolerable Grade 2 PPE or Grade 3 PPE. Proteinuria: Proteinuria occurred in 7% of CABOMETYX patients. Monitor urine protein regularly during CABOMETYX treatment. Discontinue CABOMETYX in patients who develop nephrotic syndrome. Osteonecrosis of the Jaw (ONJ): ONJ occurred in <1% of CABOMETYX patients. ONJ can manifest as jaw pain, osteomyelitis, osteitis, bone erosion, tooth or periodontal infection, toothache, gingival ulceration or erosion, persistent jaw pain, or slow healing of the mouth or jaw after dental surgery. Perform an oral examination prior to CABOMETYX initiation and periodically during treatment. Advise patients regarding good oral hygiene practices. Withhold CABOMETYX for at least 28 days prior to scheduled dental surgery or invasive dental procedures. Withhold CABOMETYX for development of ONJ until complete resolution. 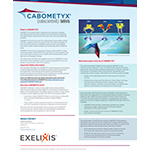 Wound Complications: Wound complications were reported with CABOMETYX. Stop CABOMETYX at least 28 days prior to scheduled surgery. Resume CABOMETYX after surgery based on clinical judgment of adequate wound healing. Withhold CABOMETYX in patients with dehiscence or wound healing complications requiring medical intervention. Reversible Posterior Leukoencephalopathy Syndrome (RPLS): RPLS, a syndrome of subcortical vasogenic edema diagnosed by characteristic finding on MRI, can occur with CABOMETYX. Evaluate for RPLS in patients presenting with seizures, headache, visual disturbances, confusion, or altered mental function. Discontinue CABOMETYX in patients who develop RPLS. Embryo-Fetal Toxicity: CABOMETYX can cause fetal harm. Advise pregnant women and females of reproductive potential of the potential risk to a fetus. Verify the pregnancy status of females of reproductive potential prior to initiating CABOMETYX and advise them to use effective contraception during treatment and for 4 months after the last dose. Adverse Reactions: The most commonly reported (≥25%) adverse reactions are: diarrhea, fatigue, decreased appetite, PPE, nausea, hypertension, and vomiting. Strong CYP3A4 Inhibitors: If coadministration with strong CYP3A4 inhibitors cannot be avoided, reduce the CABOMETYX dosage. Avoid grapefruit or grapefruit juice. Strong CYP3A4 Inducers: If coadministration with strong CYP3A4 inducers cannot be avoided, increase the CABOMETYX dosage. Avoid St. John’s wort. Lactation: Advise women not to breastfeed during CABOMETYX treatment and for 4 months after the final dose. Hepatic Impairment: In patients with moderate hepatic impairment, reduce the CABOMETYX dosage. CABOMETYX is not recommended for use in patients with severe hepatic impairment. 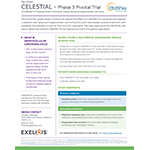 Founded in 1994, Exelixis, Inc. (Nasdaq: EXEL) is a commercially successful, oncology-focused biotechnology company that strives to accelerate the discovery, development and commercialization of new medicines for difficult-to-treat cancers. Following early work in model genetic systems, we established a broad drug discovery and development platform that has served as the foundation for our continued efforts to bring new cancer therapies to patients in need. We discovered our three commercially available products, CABOMETYX® (cabozantinib), COMETRIQ® (cabozantinib) and COTELLIC® (cobimetinib), and have entered into partnerships with leading pharmaceutical companies to bring these important medicines to patients worldwide. Supported by revenues from our marketed products and collaborations, we are committed to prudently reinvesting in our business to maximize the potential of our pipeline. We are supplementing our existing therapeutic assets with targeted business development activities and internal drug discovery – all to deliver the next generation of Exelixis medicines and help patients recover stronger and live longer. Exelixis is a member of Standard & Poor’s (S&P) MidCap 400 index, which measures the performance of profitable mid-sized companies. For more information about Exelixis, please visit www.exelixis.com, follow @ExelixisInc on Twitter or like Exelixis, Inc. on Facebook. International Agency for Research on Cancer. GLOBOCAN 2018. Liver Fact Sheet. 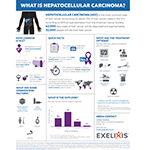 Available at: http://gco.iarc.fr/today/data/factsheets/cancers/11-Liver-fact-sheet.pdf. Accessed January 2019. American Cancer Society: Cancer Facts and Figures 2019. Available at: https://www.cancer.org/content/dam/cancer-org/research/cancer-facts-and-statistics/annual-cancer-facts-and-figures/2019/cancer-facts-and-figures-2019.pdf. Accessed January 2019.